& STILL chewing!!! LOL… absolutely no shame! so cute crazy puppy dog. it was the baskets fault. I agree. I’m sure the basket provoked the dog. Baskets are always doing things like that. Total basket cases. I’m sure the basket was doing something VERY sneaky and Snoopy HAD to step in and help….uhhuh….yep! That is one expensive chewy! The basket picked on the wrong dog to start a fight with and got what it had coming to it ! Now the whole family is safe again. I can only imagine what Snoopy would do to the Longaberger Basket building (shaped like a basket)! 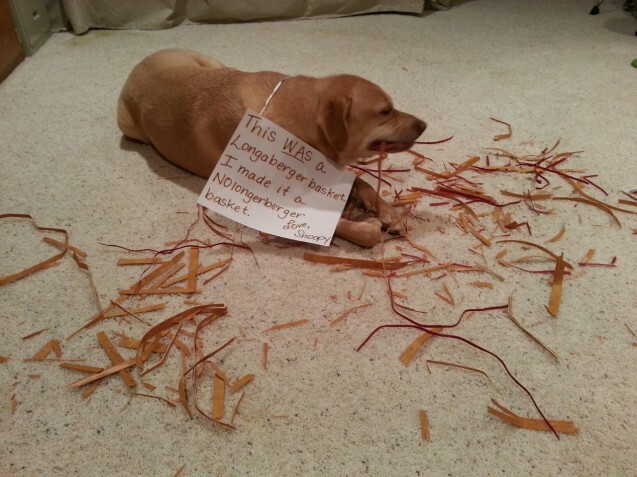 My lab once did the same thing. I saved the chewed protector for years to pull out when he was on the edge of doing something wrong to show it to him again. Been there Buffy did that twice. Had a bit of food on if an it was the end of two baskets! I just googled and priced those things. VERY expensive chew toy!